This past four months have been an amazing experience for myself and my family. My husband works at UWRF and applied to teach in the Experience Scotland program. Once accepted it took a lot of planning and saving to prepare for our temporary move to the Dalkeith House! This manor is a centuries old "palace" with an amazing amount of history, and played host to an array of royal political figures such as Mary Queen of Scots. The grounds of the house is referred to as Dalkeith Country Park which is 800 or so acres. There is a beautiful arched bridge and a small chapel on the grounds as well. It's a stunning place which became a home away from home to our family, along with the working staff, students, etc. I hope very much to return someday! Dalkeith itself isn't a huge town, but the main downtown area has a handful of charity shops, a yummy little bakery, and other interesting shopping options. Most places in town were closed by 5:30 pm, which I found both frustrating at times, and amazing. In the U.S. businesses are scrambling for our every penny, but there I felt an incredible sense of balance. It's possible!? We didn't have a car on a regular basis so we used the bus transit as our connection to Edinburgh and surrounding areas. Living this way really made me slow down and plan my time carefully. A trip into Edinburgh was a guaranteed bus time of at least 45 minutes one way, and with kids that can be tricky! We did love the double decker buses and usually made a point to sit on the second level so we could see more! The slideshow directly below shows Dalkeith House, St. Mary's Church, the bridge, and a little view of the part of Dalkeith we saw so very often! Edinburgh is a city that I will forever think of with great fondness. The architecture is so amazing, and there is so very much to see and do. All the museums are free (you only pay to see special exhibitions) for the public! I loved that because since I was homeschooling my kids while there, they were an amazing resource! I took an afternoon and photographed some of my favorite parts of Edinburgh. 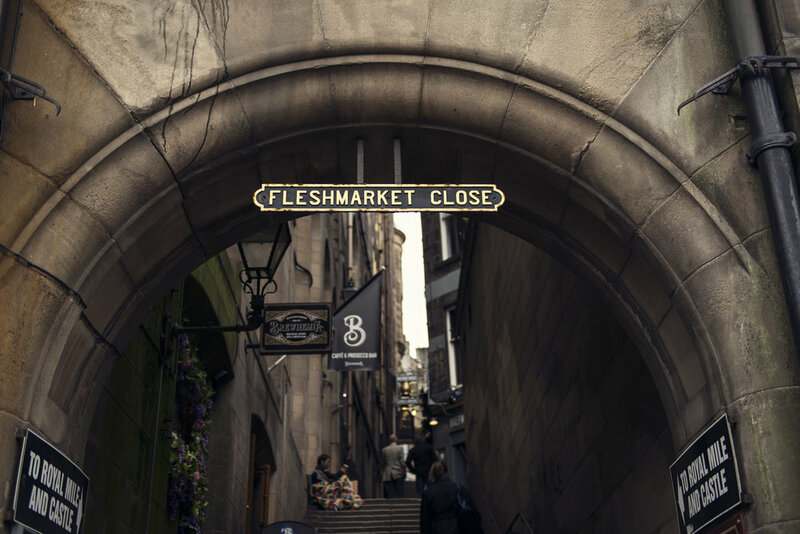 The images were taken on and around the Royal Mile. I know, very touristy of me! :-) I just had to capture the things I loved about the architecture. You'll notice in the gallery below that there are pictures of "closes". A close is a Scottish word for an alley way of sorts. It gives people access to areas that are generally for residents and not thoroughfare. Thought to be inspiration for Diagon Alley. That being said, there are other places that claim that as well such as The Shambles in York, England. We did go there and I have to admit it was far more incredible than Victoria Street! There is ALWAYS someone playing the pipes on the Royal Mile. This particular musician plays while someone pays a pound to have their picture taken with him while he plays. He doesn’t stop to interact, it’s all business! This part of Edinburgh is sort of stacked/built on top of itself. I loved all the hidden layers and stairs to get to places. It’s hard to see, but sitting atop the monument is a unicorn, which is Scotland’s official animal. Magical? Most definitely! I grew to love the Scottish people and their culture as well, but that was harder to photograph. I'm sure there are exceptions as with anywhere, but I found the Scots to be incredibly kind-hearted and very accepting. I found myself in situations where raw honesty was both surprising and amazingly refreshing. I found that those I interacted with were very direct and open, but not in a rude manner. As with the country, I equally love the people I came to know. I'll be honest, it was really hard for me to leave. It was a strange feeling being pulled in opposite directions. Part of me wanted to stay forever, and the other half longed to be back home. It's hard to adequately put into words "how our visit was", because there are things that simply can't be put into words. It's a time in my life I'll never forget, and I'll hold onto. I spent so much meaningful time with my family, and came to know my kids and to love them more than when we left. I feel like it brought our family closer together. If Dan and I do return again someday to do the program again, I'm certain the memories will be overwhelming. I'll do a follow-up blog post featuring our adventures throughout the UK soon so keep your eye out for it. What did I use in Photoshop for my image editing? "SMILE!" ... Some simple advice and tips you can use to getting that coveted "real" smile. Need a few quick tips on taking better pictures of your kids?